To celebrate this special day dedicated to Mothers, many choices exist. You can offer her gifts, flowers, a spa day or even a rigatoni necklace that will remind her the memories of your childhood. This year, we suggest you to opt for an original and unforgettable present by sharing time together! Decide to treat the taste buds of your beloved mother by offering her a succulent experience for Mother's Day. This is the best time to reserve a table in one of our branches for the 31st of March, you will be sure to enjoy an excellent time and a gourmet moment. What could be more appreciated by your mother than a gourmet experience and shared moments. For this special day, savour tasty cuisine in Caffe Concerto’s sophisticated and relaxing venues. You will find delight in our menu for a very special brunch: viennoiseries, pancakes, eggs, tartines and a large selection of continental dishes. A brunch for Mother's Day is a safe bet, the one you love the most in the world will adore! As a day of celebration, you cannot leave your mother in front of the stove, even if her cooking is always delicious. Prove your love for her by inviting her to dine at our luxuriously decorated dining rooms to enjoy a traditional and fine Italian food and, thus, experience an absolutely wonderful Mother's Day. For lunch or dinner, be charmed by our dishes made fresh everyday by our dedicated chefs. It is our philosophy to choose our products from high quality suppliers for our customers to enjoy fresh, seasonal ingredients. Succumb to our menu selection for this memorable feast : our unique Wild Mushrooms Arancini, our Rigatoni Siciliana with grilled aubergine, roasted peppers and cherry tomatoes or our delicious Braised Lamb Shank serviced with creamy mashed potatoes, roasted vegetables and gravy. 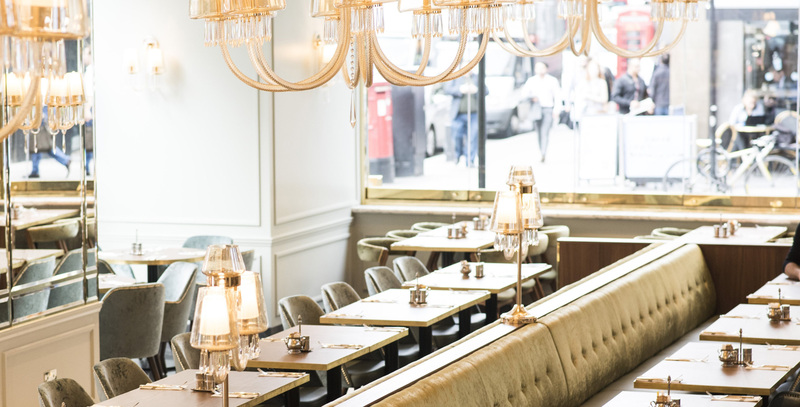 Offer an exclusive gift to your mother by inviting her to our Westfield London branch, the Grand Caffe Concerto, where you could enjoy a wonderful night thanks to our live jazz and blues sessions in London. As we are part of the best restaurants with live music in London, we can assure you a magnificent moment which will make brighten the eyes of your dear mom. If you are looking for the perfect Mother's Day gift, let us present it to you. Bring your lovely mother on a digression in time of elegance and refinement in one of our restaurants with a traditional English Afternoon Tea. Enjoy an exquisite tea time including floral blossoming tea, petit mouthfuls of delicate tartletts, scones and a selection of petit-four and viennoiseries. Mother's Day is also the superb opportunity to share your passion for desserts and other sweet treats with your mom. In each of our branches, we give you the opportunity to please the palate of your amazing mother with the best patisseries in London. You can also show all the love you have for her with a personalized cake. We have a cake delivery service in London until Sunday morning or you can also decide to collect it in one of our restaurant and surprise your precious mom. Or if you would prefer that your Mother can pick up a cake at her convenience, why not purchase a gift voucher for a six or eight inch cake or even an afternoon tea! If you would like one of our beautiful vouchers delivered in time for Mother’s Day, then please call: 0207 494 6830 and one of our members of staff will be happy to send out your gift voucher in a tastefull card and sent out by recorded delivery. We would be delighted to welcome you and your Super Mother for a peaceful and joyfull Mother’s Day full of love. *Within the limit of available place, this workshop is for individuals, friends and children over the age of 11 if attending with an adult. No experience is necessary. Ingredients, equipment and aprons are all provided.